This week’s Dorie recipe was a killer nutritionally, and so I went light on dinner. And since I also kept it simple, I can give you recipes! First, I bought some frozen salmon fillets at Trader Joe’s. We don’t eat nearly enough fish, and I keep trying to slip some into the recipe rotation. And with preparation this simple, there’s no reason not to. It takes almost no time or effort (or skill! ), and the fish comes out moist and flavorful. Heat the oven to 475 degrees. Melt the butter (or heat the olive oil) in a baking dish just large enough for your fish. When it’s hot, add the fish, skin side up, and bake for 5 minutes. Flip it over (it will fall apart!) and bake for another four minutes or so, till done. Sprinkle with dill and salt to taste. 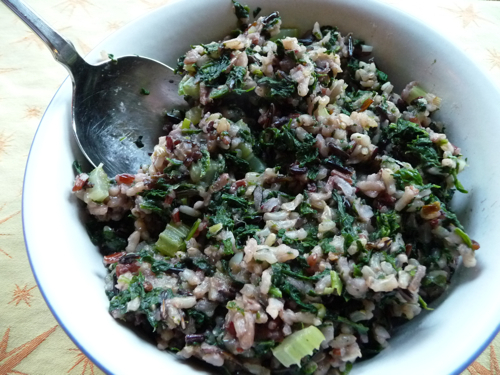 For the side, I used one of those rice mixes with brown rice and wild rice and all sorts of other rice. Lundberg makes several varieties, and Trader Joe’s has its own version. While the rice was cooking in chicken broth, I sautéed a couple of stalks of celery, three scallions (including some of the green part), two cloves of garlic, and a shallot I found at the bottom of my onion basket. When it was all soft and yummy, I added a thawed and drained (and squeezed dry) bag of frozen chopped spinach. When the rice was done, I mixed in the vegetables, and voilà. The rice was excellent with the salmon. And then there was the bread. There’s always bread on Friday. 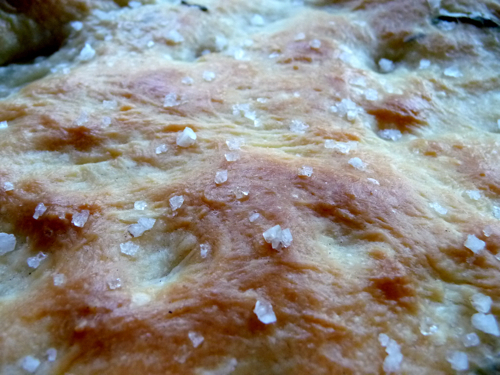 This week, in keeping with the light theme, I went with focaccia. It also had the added benefit of being incredibly easy, and for bread, fairly quick. Strip the rosemary leaves off the stem and set aside. Put the water in a large bowl. Sprinkle the yeast over the surface and let sit for a minute or so, then stir to dissolve. 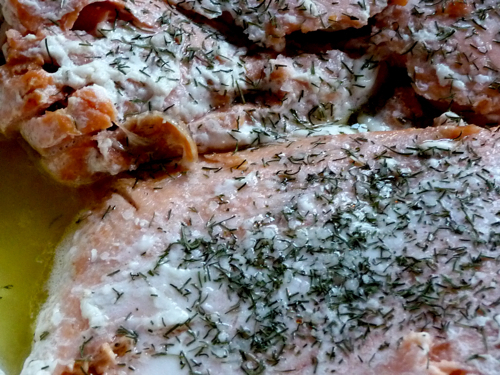 Add the rosemary, the salt, the oil, and 2½ cups of flour and mix well. I used my Kitchenaid mixer and the bread hook. Once all the flour is incorporated, cover the bowl and let the dough rest for 10 or 15 minutes. Then knead for 10 minutes or so, by hand or machine, till the dough is elastic but still sticky. Add more flour a little at a time as necessary to keep the dough from sticking to the bowl. Put the dough in an oiled bowl, turning to oil the top. Cover and let rest for about 45 minutes. Gently deflate and re-cover, then let rest about another 45 minutes, till doubled. Somewhere in the middle there, preheat the oven to 400 degrees, putting an old baking pan or cast iron frying pan on the oven floor. Shape into a ball and let rest on a lightly floured surface for 5 minutes. Then stretch into a random flat shape, about half an inch thick (although it’s not crucial that it be exactly the same thickness overall), and place on a parchment-lined baking sheet. Let rest for 20 to 30 minutes, then make dimples all over the top with your fingers. Brush with olive oil, letting some pool in the dimples, then sprinkle with coarse salt. Pour a cup of hot water into the pan on the oven floor (BE CAREFUL — the steam is wickedly painful) and bake the focaccia for about 25 minutes, till it’s nicely browned. Let cool on a wire rack for a little while, but eat while it’s still warm. This is fabulous bread, better than anything you’ll get from a bakery. And then there was dessert, but for that, you’ll have to wait till Tuesday! This entry was posted Friday, August 22nd, 2008 at 8:50 pm	and is filed under bread, food, Friday dinner. You can leave a response, or trackback from your own site.